For the past 10 years we have been treating Native American men and women for alcohol and drug dependency problems. Native Americans have been referred to us from Traditional Reservation Behavioral / Mental Health departments, as well as Native urban clinics and resource centers. Referrals have come from many states throughout the Southwest, i.e., Arizona, New Mexico, Utah, Nevada, Oklahoma and Washington. Our staff has been trained in Native American philosophies, and regularly participates in cultural diversity trainings that are provided from the local Native American Recovery Community. These individuals serve as "Sponsors" to many of the referents as they participate in 12 step meetings. Accessibility to pow wows, sweat lodges, and other traditional spiritual gatherings are made available on an individual basis. 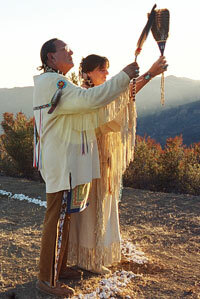 Native community Elders are also available for any Spiritual needs that may be requested by our Native clients. The use of Meth and Opioids on reservations has grown to epidemic proportions. Whiteside Manor’s proactive approach to the methamphetamine and opioid crisis has enabled us to successfully address and treat these addictions. Our years of experience treating chemical dependency allows Whiteside Manor to offer lifelong sobriety those Native American clients currently being referred to us. Whiteside has established "Direct Service" contracts with many Tribes in the Southwest United States. These federal reimbursement rates are honored in contracting "direct service" contract rates with Native Tribal contracting agencies. Whiteside Manor has made a commitment to the holistic healing process that addresses the physical, emotional, spiritual and family needs of the Native American individual.